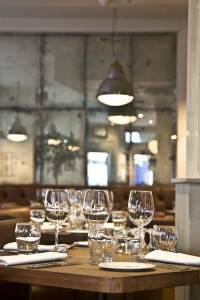 Restaurants come and go but Manson has remained a firm fixture on the Fulham Road dining scene. Inside it’s not hard to see why; the overall appeal of the place is pretty big. 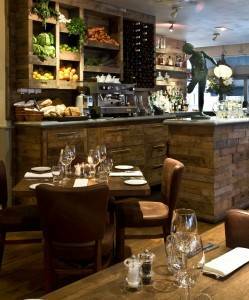 Manson is an attractive space – all wooden tables and bricks and dark brown leather seating. Once seated by the friendly staff (who will cluck and fuss over you throughout), unfold a napkin half the size of Texas, nibble on the complimentary basket of freshly baked bread and churning butter and prepare to peruse the seasonal menu. 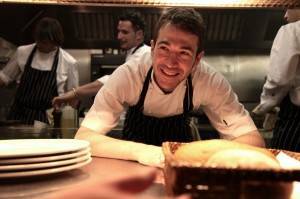 New head chef Alan Stewart (ex-Chez Bruce and Launceston Place) has introduced old English classics – think Pot roast pheasant (£16), Herdwick mutton suet pie and Cumbrian suckling pig. Vegetarians aren’t ignored either: Celeriac soup, mint oil and hazelnuts (£6.50) makes a beautifully delicate starter and the Butternut squash, rosemary curds and cep mushrooms (£14) proved sublimely satisfying. Elsewhere my carnivores companion raved about her moreish Cornish mackerel, apple celery and horseradish (£6.50) and well executed Wild black bream, Norfolk mussels, sprout leaves and smoked bacon (£17). If you’ve got room there’s an extensive list of wickedly indulgent desserts on offer, including a freshly baked chocolate tart that’s worth dumping the New Year diet for and an array of unusual flavoured sorbets and ice cream (chestnut and mulled wine anyone)? Ultimately Manson is the epitome of what a local restaurant should be. It’s the kind of place you wished you lived around the corner from. Rather than being flash or gimmicky, it’s stylish, reliable and reasonably priced – and this, Haute Living suspects, is the secret to the restaurant’s continued success. Hugely recommended. 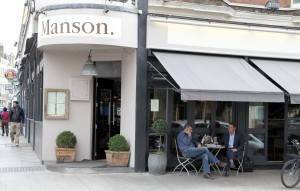 Manson, Fulham Road, Parsons Green (020 7384 9559; www.mansonrestaurant.co.uk). NB Manson is now open for brunch on Saturdays serving staples such as pancakes, yoghurt, apple and pear compote with honey, bacon cured in house with scrambled eggs, black pudding, fried duck egg, wild mushrooms and more. Older PostIs life an accumulation of anguish?